Fonon Technology International has developed a completely new industrial method known to the world as Zero Width Laser Cutting TechnologyTM (ZWLCTTM). The ZWLCTTM technique uses a laser controlled Power Density profile on the material surface to generate the subsurface forces greater than intermolecular connections. Our patented Zero Width Laser Cutting TechnologyTM (ZWLCTTM) has the highest level of precision known to man. This technology has dramatically improved the substrate separation process, specifically for latest generations (Gen 6, 7, and 8) glass panels for Flat Panel Display (FPD) manufacturing. The methodology utilizes a non-contact laser induced internal stress to produce a controlled separation. Since the technique is non-contact, the surface degradation associated with mechanical scribe and break is eliminated. Yield loss as a result of particulate damage is also greatly reduced. Cutting substrates in clean room conditions becomes feasible with ZWLCTTM leading to the ability to introduce a production line concept into clean room substrate manufacturing. This has not been possible before because of debris generated during cutting and edge grinding which will not be generated during ZWLCTTM processing. In addition, cleaning facilities can also be substantially reduced. These factors offer a cost effective solution to manufacturing space and efficiency. Our latest mathematical modeling and empirical data gathering resulted in the development of an improved method and the requisite industrial machinery to enable us to introduce these improvements into the FPD industry. With this new method we can create internal tensile forces so great that we can achieve total separation of display type glass WITHOUT COOLING. 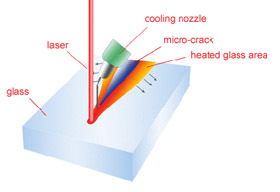 Under these conditions the MicroCrack™ would propagate in the glass body at a depth of more than 0.7 mm (for bare glass). This process is called Full Body Separation. The ZWLCTTM method incorporates cooling of the glass surface following controlled heating, with the correct power density profile, this creates the intermolecular separation of the glass substrate to a certain depth. Depth ( t ) has an inverse relation to the speed ( v ) of cutting, assuming that power ( P ) is constant. This means that the slower the speed the deeper the MicroCrack™ that is formed. Both mathematical models and empirical data support these conclusions and field experience has verified these findings. Zero Width Laser Cutting TechnologyTM is the only technology available in the world with a NON DIMENSIONAL cutting line. The waste material by the cutting process is totally eliminated.